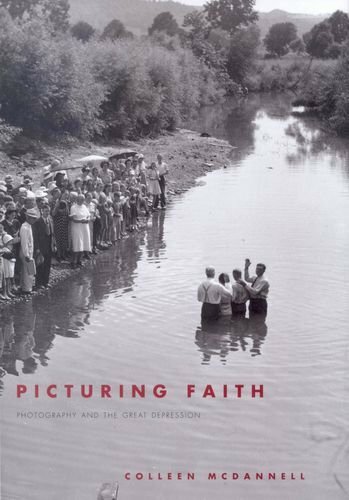 A story of American photographers who went out to chronicle the Depression era-and the vibrant religious culture they found In the midst of the Great Depression, the American government initiated one of the most ambitious national photographic projects ever undertaken. Such photographers as Dorothea Lange, Walker Evans, and Gordon Parks-all then virtually unknown-were commissioned to chronicle in pictures the economic struggle and social dislocation of the Depression era. They explored every facet of rural life in an effort to document the troubles, as well as the spirit, of the nation. Fanning out across the country, these photographers captured a nation alive with religious faith-from Dust Bowl migrants singing hymns to orthodox Jews praying in rural Connecticut. In Picturing Faith, the preeminent historian of religion Colleen McDannell recounts the history of this extraordinary project, telling the stories of the men and women who participated in it and exploring these little-known images of America. Lavishly illustrated, Picturing Faith teases out the various and conflicting ways that these photographers portrayed American religion and enhances our understanding of how religion was practiced during this critical period of American history. Colleen McDannell is professor of history and Sterling M. McMurrin Professor of Religious Studies at the University of Utah.